Occipital nerve stimulation (ONS) has raised new hope for drug-resistant chronic cluster headache (drCCH), a devastating condition. However its mode of action remains elusive. Since the long delay to meaningful effect suggests that ONS induces slow neuromodulation, we have searched for changes in central pain-control areas using metabolic neuroimaging. The following is a description of what it feels like to experience a cluster headache attack. Cluster headaches range in intensity and any seasoned cluster headache patient knows well how to quickly rate the pain they are feeling on a scale of 1-10. The following is an example of a level 8 cluster headache attack. headaches who was successfully treated with the Koren Specific Technique. 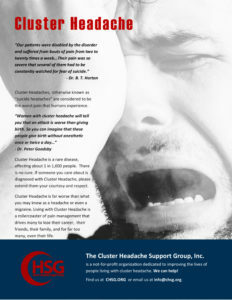 Cluster headache (CH) pain is the most severe of the primary headache syndromes. It is characterized by periodic attacks of strictly unilateral pain associated with ipsilateral cranial autonomic symptoms. The majority of patients have episodic CH, with cluster periods that typically occur in a circannual rhythm, while 10% suffer from the chronic form, with no significant remissions between cluster periods.